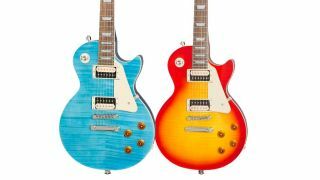 Guitar Center has announced a top-notch deal on the Epiphone Les Paul Traditional Pro-III Plus, which comes fitted with Gibson USA pickups. Guitar Center is selling this terrific single-cut for just $499, a whole $200 off the original asking price of $699. Aside from the made-in-USA Gibson ’57 Classic and Super ’57 zebra pickups, this LP features coil-split, boost and phase on push/pull control pots. As is the case with many other Black Friday deals, this offer is only available on specific finishes, in this case Ocean Blue and Heritage Cherry Sunburst. Trans Black and Desert Burst will set you back the regular $699.